Computer Sales & Repair | Reveille Systems, Inc. Whether you are a small, medium, or large business, Reveille Systems understands the complexity of technology facing these businesses. To provide our customers with ease and comfort, we are always there to offer quality computer sales and repair services throughout Fredericksburg, Northern Virginia, Washington DC, and MD. Our expert technicians and sales staff are always there to provide you guidance in matching the right computer systems according to your business needs. 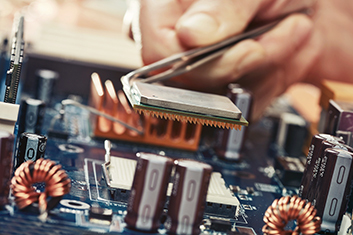 DIAGNOSTICS TESTS – Our service technicians perform a variety of diagnostic tests to ensure your computer system is performing at optimal efficiency. Whether it is software or a hardware related issue, our expert staff works to identify the root cause of problems and ensures the right corrective actions are taken to restore full functionality to your computer system. PERFORMANCE TUNE-UP – One of the most important parts of computer repair and maintenance is performance tuning. Many end-users have limited knowledge or experience with operating system critical updates, hardware maintenance, and malware. Over time and left unattended, many of these items degrade performance, cause user frustration, and can lead to data loss. Maintaining your computer system using best practices will ensure your computer system will perform at peak efficiency. SOFTWARE AND HARDWARE REPAIR – Even well maintained computer systems can sometimes face compatibilty problems, become infected with malware, or suffer a hardware failure. When your computer systems are down or performance is degraded, this can lead to lost productivity in the office or even lost revenues. Our team of technicians work quickly to respond when our customers face these challenges reducing downtime and ensuring revenue potential is maximized. We have developed a reputation for offering value pricing to customers throughout Fredericksburg and Northern Virginia, Washington DC & Maryland. Understanding the diverse needs of our clients, we offer computer sales in Maryland and services for many industry leading brands including Dell, Microsoft, HP, Symantec, Cisco, Lenovo, Cbeyond and many more. We are a proud value-added reseller (VAR) of laptops, servers, operating systems, workstations, printers, technical support, tablet PCs, security packages, backup and recovery packages, networking solutions and much more. We also offer promotional discounts on many products and provide technical support services direct from the vendor. By taking advantage of our sales services, our clients have access to warranties and training direct from the vendor. Call us today at (540) 373-9595 to get your order started!